So, am I the only mom who has realized it's hard being pregnant and holding a toddler up to wash their hands in the sink?! I never realized but I held her on my stomach while I helped rinse off her hands. And with my belly growing bigger by the day this was not going to cut if for long. So, 'a researching we go, a researching we go'...(sing with me). I looked up the safest kind of step stool and realized their really isn't a safe kind of step stool. They all have the potential of my child stepping to the side or back and falling and cracking her head open (yes, I'm a worst case scenario kind of person). Even ones with the handle bars on the sides didn't give me enough peace, and that's when I found......the kitchen tower. Some brands call them the learning tower, some the kitchen tower, but really it's just a 'help mama' tower. 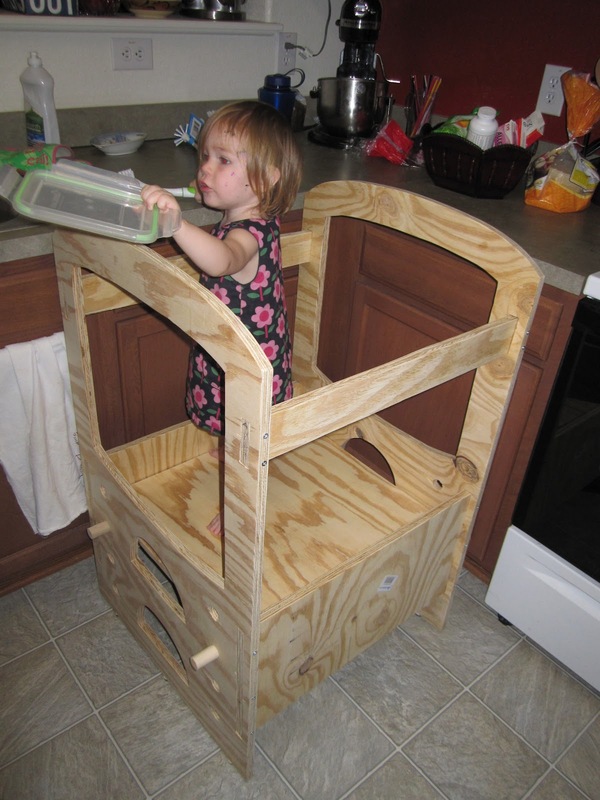 These are towers designed to keep the child at counter heights, without the risk of them falling back. I love them!! But I did NOT love the price tag! Saving for baby number 2, so 'a researching we go, a researching we go'....(come on, you know your humming it). I ended up finding this amazing blog, which had a pattern to follow!! They are so generous to give away the design for free and I always give credit where credit is due, so a big shout out to Ohdeedoh. My husband went and bought the tools he needed (an investment for my growing list of things for him to build, now that's he's proved himself with this tower, lol) and the supplies. 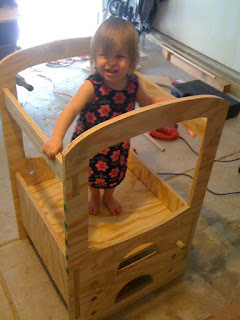 Two days later, here Kara is dancing inside of it while Daddy is finishing up sanding it down. I still haven't decided what color I'm going to paint it, but all the same, it works!! 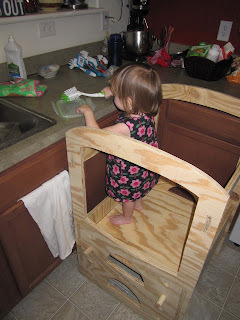 It's awesome and now Kara is not only washing her hand by herself, she is helping mommy clean dishes and prepare lunch and dinner. A couple things to mention about the design: Yes, this tower is HUGE! It ended up even bigger than what I thought, but since our kitchen is pretty big to begin with it doesn't bother me in the slightest, but this is something to be aware of before you get started. Also, we added some foot gliders on the bottom, so we can slide it in and out of the way really easy. We also added an extra height option to it. The pattern showed 3 but I didn't think she'd grow in such huge spurts, so we spaced out and added another. But didn't think about the fact that it would block the step holes when it was in the 2nd to highest position. See what I mean: okay the image doesn't show it the best but the flat square cuts through the foot hole on top. But really it doesn't matter to us because our Kara doesn't even use the foot holes, she just climbs over the side. So, I wonder if the steps are even necessary? I'm also thinking of adding a dry erase board to the back side, just so she won't fall back accidentally and for extra fun in the kitchen. I'll post pictures once we ever do that.